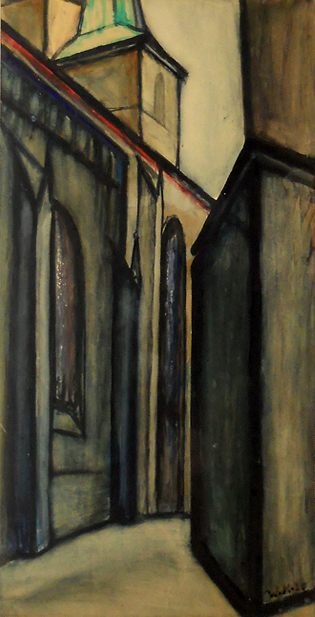 „Dom und Severi Kirche Erfurt“, 1920, watercolor on paper. Kirch was founding member of the Erfurt expressionist group „Jung Erfurt“, 1919-1924. Willy Kirch was born in 1892. He got his first artistic education at the Staatlich-städtischen Handwerker- und Kunstgewerbeschule in Erfurt, Thuringia. From 1910 to 1912 he studied at the Staatliche Kunstschule in Berlin at the class of the symbolist/expressionist artist Prof. Erich Kuithan (1875-1917). In 1914, Kirch became drawing teacher in Erfurt. Together with Walter Fernkorn, Theo Kellner, Alfred Hanf, Otto Mehmel, Richard Bauroth, Curt Hotzel, Walter Passarge he founded the rebellious expressionist group „Jung Erfurt“. Later on, Willy Robert Huth, Karl Schneider and Karl Lüdecke joined the group. The members engaged in exhibitions, published manifestos with their „Stierpresse“ and held lectures in Erfurt. In 1922/23 Kirch and his friend Alfred Hanf equiped the Lloydmotorship „Stadt Erfurt“ with paintings. The ship shortly after. In 1924, the expressionist group „Jung-Erfurt“ fell apart. Kirch continued to teach at the Handwerker- und Kunstgewerbeschule in Erfurt, Thuringia. He died in Erfurt in 1943. Source: Mühlhäuser Museen: Kunst des Expressionismus – Die Gruppe Jung-Erfurt 1919 bis 1924, Mühlhausen, 1997.